The program committee is currently working on CME credit with a co-sponsoring organization. More details in the future will be available at our Facebook page. All participants will receive a certificate of attendance. CME Tuition is $175 and $150 for TAPF members. A special rate of $100 is available for attendees not needing CME. Tuition includes Friday night reception, breakfast and lunch on Saturday. Additional fees will apply for other meals and activities. Written cancellations should be received by TAPF at least 1 month prior to the program and will be refunded less a $25 administrative fee. Attendees should register by June 1. Late registration will increase to $200 for non-TAPF members and $175 for TAPF members. Registration is available online at: http://www.regonline.com/TAPF2012. All sessions will be held at Mandalay Bay Resort and Casino, 3950 Las Vegas Boulevard South, Las Vegas, NV 89119. This hotel is located at the end of Strip and convenient to many attractions in Las Vegas. Visit http://www.mandalaybay.com/ to learn more about this hotel. We have a special group rate is $165 for Deluxe rooms. Suites are available upon request. This rate does not include taxes or meals. 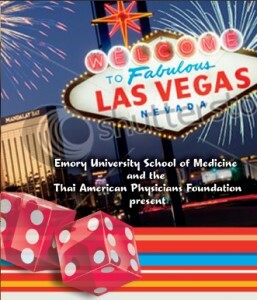 Guest should call 1-877-632-9001 and mention that they are attending the Thai American Physicians Foundation/Emory CME conference. Guests can also make reservations online at https://resweb.passkey.com/go/xtapf. This special rate is extremely limited. Guests are encouraged to make reservations as soon as possible and no later than May 1, 2012.